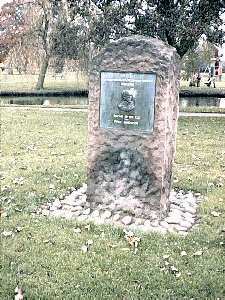 As we cross over the Boating Pool bridge and take the path behind the pavilion back towards the rose garden, we pass the Memorial to Lieutenant Swinfen-Broun who contributed much to Lichfield in the past including a Charitable Trust in perpetuity for the benefit of the City and it's citizens. 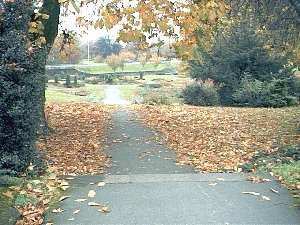 We cross the Playing Fields along the line of the Chestnut trees and aim for Bunker's Hill Car Park. The picture on the left takes in the view back the way we have just come. 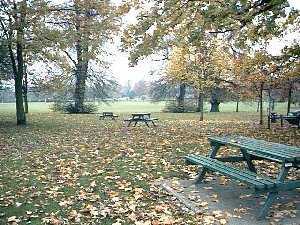 Sit awhile under the trees and enjoy the tranquility of the scene except for weekends, when everybody seems to be out playing football as far as the eye can see. We cross over the road into Friary Gardens, through which Trunkfield brook makes it's way, to join up with Leomansley Brook, somewhere under the Tennis Courts, before both emerge together into Minster Pool. 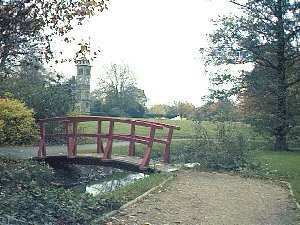 The view to the right is across the bridge with the Clock Tower in the background. The Clock Tower started life opposite the Friary old building on the corner of Bore and Bird Streets but was moved early in the 20th century to it's present position to make way for a new road to take traffic away from the centre of the City as the old route used to be up Sandford Street which was, and still is very narrow. 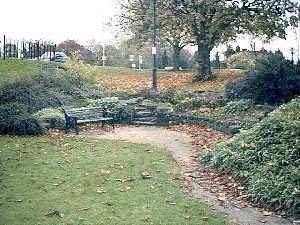 Wander along the pathway beside the brook and through the tunnel under the A51 and you will emerge in the Jubilee Gardens which you see above in their Autumn setting. Last updated: July 26th, 2006.